This is what memories are made of. When new meets old. 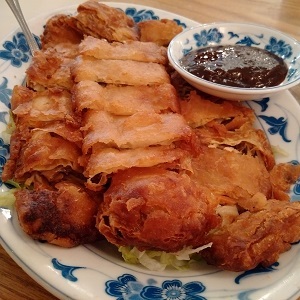 It had been many many years, perhaps 20, since I last ate at High Pearl in Elmhurst, New York. The only thing that’s changed in all those years is the name. It now operates under the name of China Pearl. Though you can’t tell that from the sign on the front of the restaurant. Unless you can read Chinese. And even then I’m not sure. I can’t read Chinese. Another thing that hasn’t changed is that today, just like 20 years ago, I was the only Caucasian in the restaurant. 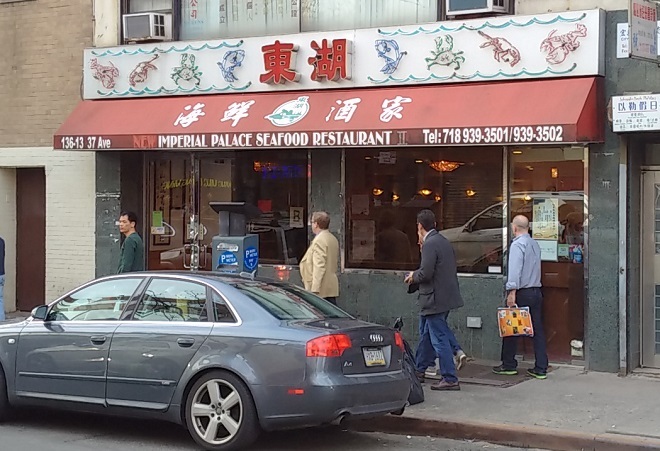 What a hidden gem, a PEARL in fact!, this Chinese restaurant is. And the new memories made today are going with eight co-workers for lunch. A splendid time was had by all. Especially judging by the smiles on our faces. I smiled a lot. I couldn’t understand what everyone was talking about a lot of the time. So I sat there and smiled. At least I wasn’t the only one! 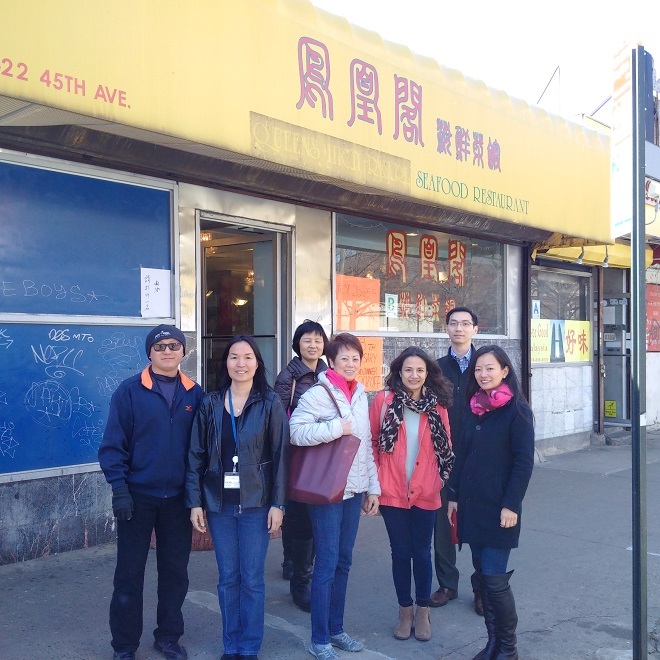 China Pearl (or High Pearl if you still prefer) is located at 82-22 45th Ave, Elmhurst, NY 11373. There is only street parking, or you can take the “M” or “R” train to the Elmhurst subway station and walk less than half a block to the restaurant. Fair warning, the name of the restaurant isn’t on the sign or the window. Why were we waiting outside the restaurant? Well, of course, to pose for the picture. But even more importantly, we had to wait for them to open. Which they promptly did at 12 noon. And rush inside as we did when the doors were unlocked, we had a choice of tables. We choose the best in the house! I hoped as hard as I could that they would serve the appetizer that “we” (not us in the sense of me and my co-workers as this was our first time there together, but we in the sense referring to when I went so many times so many years ago) always started our meals there with. While we tried to pronounce it two different ways, we were talking the same thing and we ended up with what I was hoping for! Fu Pi Guan (pictured below on the left) if you speak Cantonese (Fu Pi Juan if Mandarin). But before that came out, we had two large bowls of soup, Fish Maws with Sliced Ham Soup, which I thought was out of this world, and Treasure Winter Melon Soup. As our food was served fast and furious, I didn’t get a chance to try the Winter Melon Soup. I really hoped to. I thought I would finish my meal with a bowl, but by the time I was so full there was no way I could even try a spoonful. Others that tried said they preferred the Fish Maws with Sliced Ham Soup over the Winter Melon Soup. 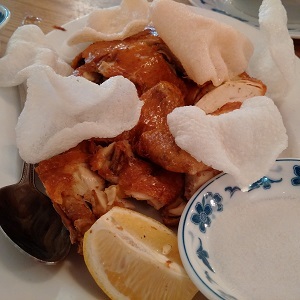 Next came Roast Chicken Cantonese Style (pictured above on the right), which was served with Shrimp Toast. I must say the crispy skin of the chicken was out of this world. The chicken was slightly on the dry side. 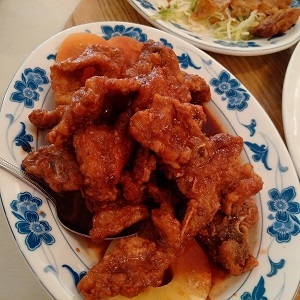 As you will discover when you go to a truly authentic Chinese restaurant, the really REALLY good dishes aren’t found on the menu. 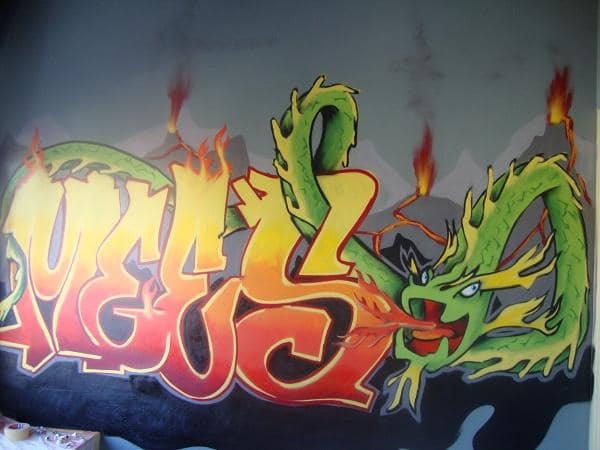 You either have to speak or read Chinese, or know what you want, such as the Fu Pi Guan we had. 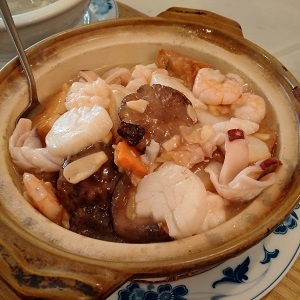 And also the Seafood Combination Hot Pot (pictured below on the left). This dish was a very nice surprise. I liked it a lot. China Pearl is labeled as a Seafood Restaurant, so I definitely wanted to make sure that we ordered at least one seafood dish. We had a second! Fresh Squid with Chili and Spiced Salt. This was really good! 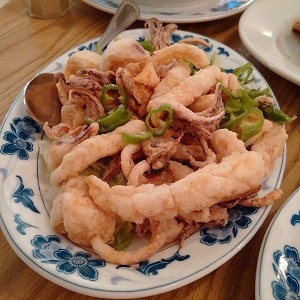 I’ve had squid (aka calamari) at a few other Chinese restaurants, and I really liked the way they prepare them SO light and SO delicious!! This was my favorite of all the dishes that we had. Though, as we realized later, a lot of the dishes were quite salty (laced with MSG?) and a few of us complained for hours afterward about the salty taste left in our mouths and our seemingly unquenchable thirst! Completing our feast, we had Pork Chop Peking Style. Always one of my favorite dishes. Rarely am I disappointed when I have it. And today was no exception. Most excellent! 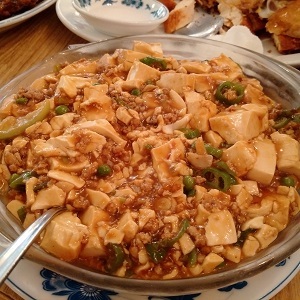 And finally, and especially for those who liked there food kicked up a notch came Bean Curd (Tofu) with Minced Pork Szechuan Style (at least that’s what I think that dish was called). It was definitely Szechuan style as those who ate said it was VERY spicy! It too was a big hit amongst those sitting at the table. And I could say at the restaurant, as by the time we left we were still the only patrons. I know the restaurant gets crowded at dinner time. Especially late. 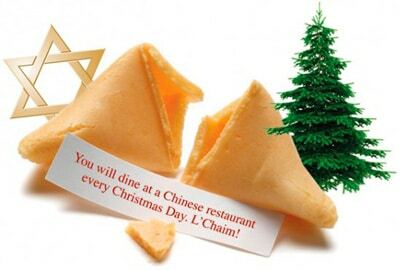 But, if you are in the area at lunch time, do definitely try China Pearl! 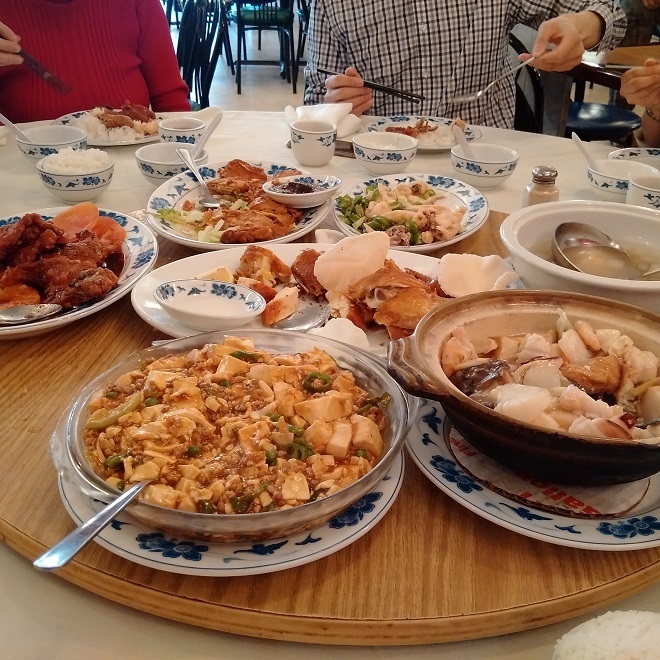 As I mentioned the food came fast and furious, and before we knew it our Lazy Susan overfloweth. Almost as much as our bellies overflowed when we were done. If it wasn’t for the fact that we had to return to work, I think we would have hung around the neighborhood and checked out the bakeries and Asian Supermarkets… or, taken a nap! 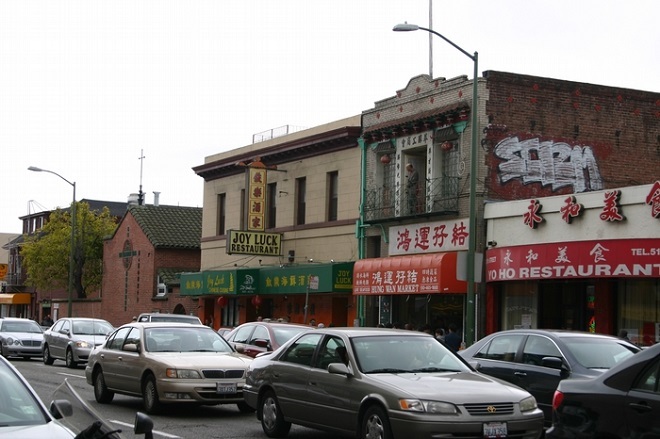 Previous: Your Favorite Chinese Restaurant Just Closed!